It is a valuable reminder that I am personally in love with less…. more said with less, reductionism, call it what you like, and equally not at the expense of dynamics, but when the outcome excells, it IS self evident: LESS IS MORE, but how so? Maybe, for once, the Oscars acknowledged it: a US$11million film takes out a US$290mill film… I would happily acknowledge the quieter film won; but not by genre expectations, because you would expect a bomb disposal film set in Iraq to be as loud, louder or at least equal to a science fiction film. But no, defying expectations the quieter film won. And not just for sound design and for sound mixing – also for best film and best direction. Now that really IS fighting above your weight. To me that says emotional gravitas won over spectacle and my total respect goes to Kathryn Bigelow and Sound Designer/Re-recording mixer Paul Ottosson. The quieter film won, on all fronts and THAT is a MASSIVE achievement! Frankly I don’t know how anyone makes & mixes those huge action films. God bless Transforminators & their ilk, but when you turn them down to a normal/personal monitoring level I am not sure they really work as films any more. I watched the first Transformers on the plane home from Japan a few years ago & it came off to me as a caricature or parody/comedy; just going through the motions… all its power was lost. And I suspect that also was what lost Avatar the Oscars it so so desperately wanted to win: it simply doesn’t scale. So what does that say about art universally? Nothing, absolutely nothing. Great loud films will succeed in the future just as great quiet films will too. I know which I prefer to work on but referring back to those pesky Oscars its helpful to remember that genre does not dictate dynamics – artists do. It was the creative choices made by Kathryn Bigelow & Paul Ottosson that led The Hurt Locker to not be a loud film and for that they should be applauded. A final anecdote & question about silence in art: a few years ago I attended a screening at the NZ International Film Festival where an acclaimed electronic minimalist musician was performing a live accompaniment to an equally minimalist film. I was totally open to the approach taken but I left incredibly frustrated, simply because from frame one until the end of the credits there was droney minimalist music, but not one second of silence. How could someone be a minimalist & not engage silence in their work? If I was to consider the dynamic range of ideas in that particular live score I would say it was similar to some of the cursed pop music blaring from radios… But ever since I have wondered, are we afraid of silence? Directly related to this question; I’m currently working on a commissioned remix of a beautiful classical piece and there are definitely momentary silences in my version of it, but I got to thinking: if it was performed live as a concert is the fear that a silence might confuse the audience that the piece is finished? Is that part of the fear of silence in creative works? Over at the Social Sound Design site I asked the question: In my opinion some of the best film sound is not loud or overt, so I am interested to know what your favorite use of silence or near-silence is in a film? The answers are interesting & it has prompted some films worth revisiting but my question was partly motivated by reading someone say online that “you can’t use silence in a film – it could be mistaken for a technical fault” which is such wrong-headed thinking… The use of silence is about context – of course if you cut in a burst of silence inappropriately into a film soundtrack it will be ‘read’ as a mistake, but migrating a scene to silence in a very carefully considered & evolved way would never be mistaken as a fault, because by its very nature it is intentional and if implemented correctly (ie so the audience don’t quite realise it) then you end up in the most amazing place where the absence of sound is everything. I’ve been there on at least half a dozen films and no one has ever claimed it was a mistake. But when people I know say they saw the film I ask, did you notice the silence? Almost always the answer is no. Success!!! And a final quick anecdote: I took that photo of the Quiet Please sign at a temple in Kamakura and it makes me smile every time I see it because of the subtext. 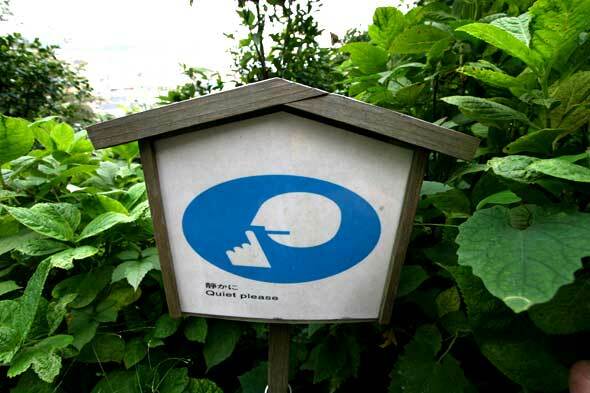 A slang term for westerners in Japan is gaijin but there is also a variation commenting on Westerners long nose so it amuses me that the Quiet Please sign features an icon with a big nose! In a subtle way it actually says: QUIET PLEASE TOURISTS! Great article, and thanks for the link to that NPR blog too. Just one note: Minimalism is not about silence, and in fact can be rather dense and loud. To expect a minimalist to be silent is… to expect pop music to care about dynamic range. Actually, I do care about this issue in pop music, especially when I buy a series of remastered classics only to find the music has been completely butchered. Enjoyed reading that.. Have been considering this issue lately, being in the midst of writing an album.. I feel somewhat forced to push the levels a bit so that it doesn’t get annoying when shuffling with other tracks. Hypothetically.. it would be useful if there was a meta-data entry implemented for popular music formats that could suggest a relative playback level to digital media players. Unless you’re turning your player up to 11 all the time there is a lot of amp headroom to play with. Then a loud and squashed mix can be played quite comfortably next to a more subtle one. 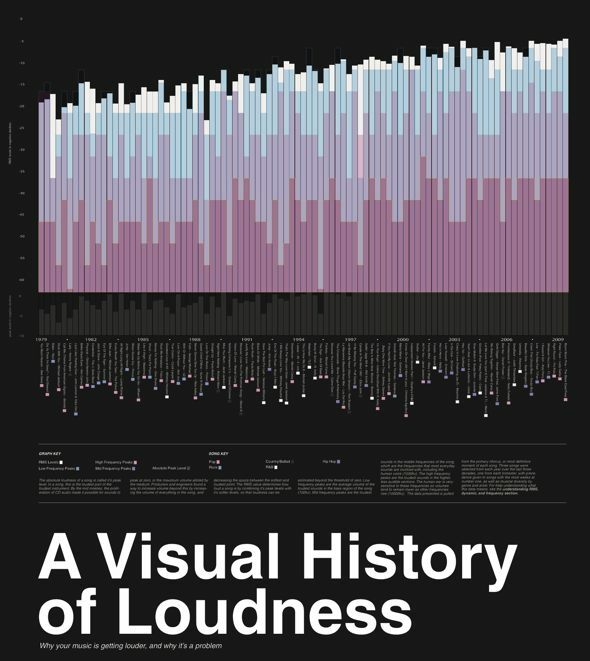 One could do this retrospectively by analyzing each track before playback, but it might be better as a setting that the mixer or mastering engineer had access to. One of my favorite films for use of effective silence is House of Flying Daggers. There were wonderful moments in the film ‘No Country for old Men’ where the Cohen brothers choose to not have any music and let the assassin’s footsteps be the only sound to carry the scene. 4′ 33″. John Cage composed a piece where the performer just sat in front of a music stand for 4 minutes and 33 seconds. The ‘music’ was derived from the reaction of the audience. People shuffling their feet, nervous coughs, sniffles.